Roy Lichtenstein’s pop art is infamous and instantly recognisable, and his name has almost become synonymous with the pop art movement. Combining elements from commercial advertising, comics and popular culture with the Ben-Day dots technique, Lichtenstein’s work helped define the movement. Formed by artists who wanted to challenge elitism in art, the movement began in the 1950s and flourished in various countries. Artists started using aspects of mass culture in their work, finding inspiration in commercial adverts, comic strips and everyday artefacts. Jasper Johns and Robert Rauschenberg created some of the earliest works recognised as pop art in America, and it became increasingly popular during the 1960s when Roy Lichtenstein and Andy Warhol produced some of their most notable paintings. Subverting beliefs about what constituted art and breaking down the boundaries between “high brow” and “low brow” art drove the pop art movement. 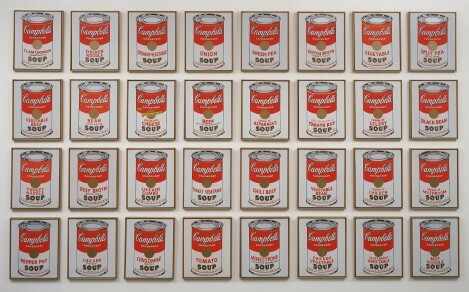 Several artists started including ordinary elements of modern life in their work, painting commonplace objects like cans of soup and washing powder. They also used parody and irony to satirise commercialism and materialism in society. Lichtenstein is one of the most prominent pop artists because his style and techniques helped characterise and popularise the movement. He experimented with the Ben-Day dots technique, giving it a contemporary twist in his work. He used Ben-Day dots in most of his famous paintings and they became a signature element of his work. Comic strips inspired many of the pop artists, and Lichtenstein was intrigued by their “highly emotional content yet detached, impersonal handling” of topics like romance, hate and war. He often emulated the style of comics, taking scenes from contemporary comics and adapting them. He tended to change the original comic to convey different narratives, emphasise the emotional content and add his own critique. Many of Lichtenstein’s famous works are derived from DC Comics, and he was known to choose particularly emotive scenes. His best known piece, Whaam! (1963), was inspired by DC’s All-American Men of War comic, depicting a jet fighter shooting down another plane. Lichtenstein composed the painting so that the shooting plane and the plane under attack are on different panels, creating a detached, impersonal effect and separating the action from the consequence. 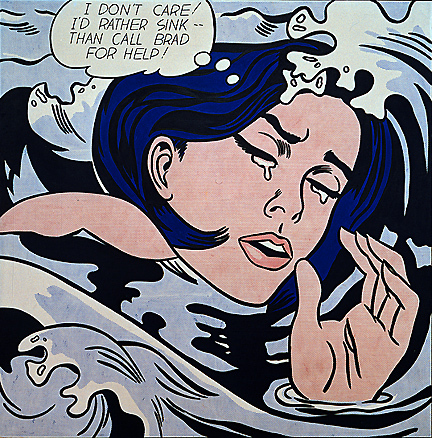 Drowning Girl (1963) is another of his most famous paintings, taken from a scene in DC’s Secret Love #3. This features a distressed woman being enveloped by turbulent waves. The original comic gives more context to her situation, but Lichtenstein’s choice to crop the frame emphasises her emotional state and invites us to create a narrative of our own. He produced a number of paintings similar to this one, including In the Car (1963), Ohhh…Alright… (1964) and Oh, Jeff…I Love You Too, But…(1964). Although he was a key figure in the pop art movement, Lichtenstein was also interested in surrealism, cubism, German expressionism and abstract expressionism. As well as painting prolifically, he produced a number of sculptures in his career. His work is still displayed in some of the world’s largest galleries and continues to inspire artists today.